Published: Sept. 27, 2014 at 08:27 p.m. 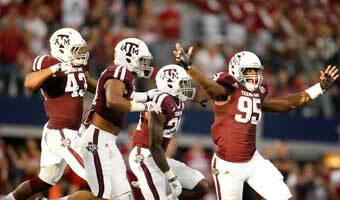 Updated: Sept. 27, 2014 at 08:36 p.m.
Texas A&M QB Kenny Hill wasn't perfect, but he managed to make the plays necessary to defeat Arkansas. For a half, the Trill was gone. But with former Aggies star Johnny Manziel on the sideline (the Cleveland Browns are idle this weekend), Texas A&M quarterback Kenny "Trill" Hill found some Manziel-like magic to lead a 35-28 overtime win over Arkansas. With a pair of fourth-quarter touchdown passes and yet another in overtime, the Aggies remain undefeated after escaping a scare from a Razorbacks team that ran the ball almost at will. In the first quarter, Hill was just 3 of 7 for 15 yards, and by haltime, he wasn't much better: 10 of 22 for 96 yards. But by the time he was finished, the sophomore's numbers looked like this: 21 of 41, 386 yards, four touchdowns and one interception. Hill's comeback began with an 86-yard touchdown pass to Edward Pope to cut the Razorbacks' 28-14 fourth-quarter lead in half. A 59-yard scoring strike to Josh Reynolds, who had dropped two well-thrown Hill passes earlier in the game, tied the score at 28. Hill capped the comeback with a 25-yard touchdown pass on the first play of overtime, finding Malcome Kennedy over the middle of the Arkansas defense, which had been duped by a Hill pump fake toward a screen route in the flat. 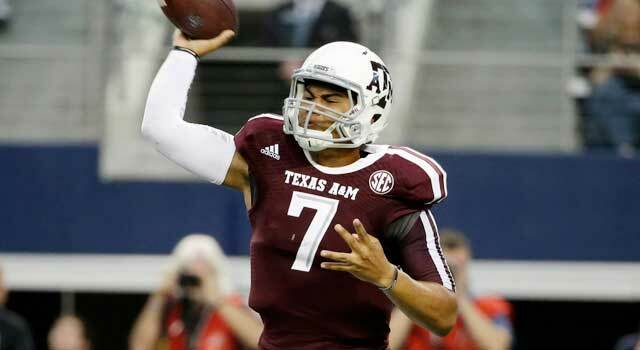 Still, the second half wasn't without its trials for the Aggies' new starter at quarterback. He threw his only interception in the midst of the comeback, on an underthrown deep ball that gave Arkansas possession with a 7-point, fourth-quarter lead. He also missed a chance to end the game in regulation with a possession starting from his own 25 with 1:18 remaining, needing just a field goal for the win. He was unable to advance the ball past midfield, however, and the TAMU coaching staff elected to let the clock run out rather than risk running a fourth-and-short play that could have given Arkansas its own field goal chance.